Work with us as your Business Coach and we guarantee profitable results! We have designed our range of Business Coaching Programs & Business Coaching and Training Services with you in mind. Our primary purpose is to “Coach and train Small Businesses how to grow, automate and thrive in business.” As such, we have designed our services so that some sort of Coaching and Training is accessible and affordable for every Small Business. Every program will help you to grow, automate and thrive in business and it is a profitable strategy for you. 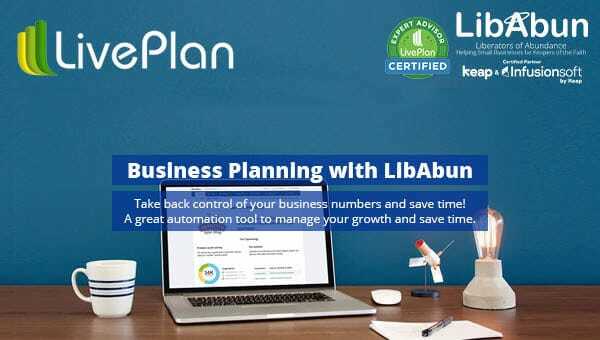 At LibAbun, we encourage small businesses to use CRM software Keap or Infusionsoft by Keap. The reason for this is that we have many automation & growth tools available through the use of this software in your business. All our Coaching programs come with our “26-Week Guarantee” whereby, if we agree to work with you, we will guarantee to increase your monthly gross profit, by more than your monthly investment in our Coaching Program. If we do not achieve that with you inside 26-weeks, then our coaching services will be ‘Free’ until we have . This in effect guarantees that our services are profitable for you inside 26-weeks. Our One-to-One Business Coaching services are designed to give you profitable results in the shortest possible time. So much so, that if we agree to work with you, we guarantee profitable results for you within 26 weeks. For us to guarantee those sort of results, we have to conduct a ‘Business Growth Audit‘ with you to discuss your business goals, and to identify the business development opportunities, to help you achieve them. This ‘Business Growth Audit‘ takes about 2-hours and is complimentary. There are only a handful of these appointments available each week, so you will need to book these appointment typically 2-3 weeks in advance. Our Group Coaching Courses are designed specifically for Small Businesses with an Annual Sales Revenue of £30,000-£250,000. Our Group Business Coaching program is conducted twice a month via an interactive group webinar exclusively for the Group Coaching course members. This is an ongoing course, that covers many business development subjects, including Business Planning, Marketing, Sales, automation and more. This course is a ‘rolling monthly agreement’. You will stay with the Group Coaching course for as long as you are getting value and you can upgrade/downgrade or leave whenever you want. This course is also covered by our LibAbun 26-week Guarantee. All our customers, regardless as to which Coaching or training program they are on, are given the education and tools to conduct Small Business Planning to really create sustainable growth in their businesses. Business Planning in your business is critical to have clarity as to where you are going, what are the most important facets to work on and to manage your progress toward achieving these goals. You will get to collate your planning using our planning templates and using your real numbers in your business to collate a realistic quarterly business plan, a quarterly forecast, budget and tax planning as well. Our planning tools integrate fully with online accounting software, Xero and Quickbooks to provide you with graphs and a dashboard to really empower your business management and decision. Our Business Planning system systematically revolves around a quarterly 90-Day Planning system. You will get to learn how to conduct the ‘4-R’s’ in business – record, report, review and reassess, very effectively to be in total control of your business growth, sales, and profitability. You will gain total control of your business and finally be empowered to really transform the growth of your business in a ‘systematic’ way. This, in turn, will give you a ‘real sense of being in control’ of your business and you’ll feel much more encouraged and excited about the future outcomes of your business too. Find out more about our Small Business Planning program here. Our LibAbunBEN – Business Educational Network Groups conduct a weekly meeting at a specified location. Our LibAbunBEN Business Educational Network is designed specifically to introduce Small Businesses to a regular weekly business development schedule that works on a business development strategy to help you grow, automate and thrive in business. You’ll learn how to grow all the numbers represented in your business over time in a systematic way. You’ll also develop a ‘trusted network’ of ‘Like-minded’ Small Business people. All Members get to learn about, develop, share and grow their business plans and goals with the other members. In just one day you could implement a Chatbot into your business. Since 2017/18 there has been a new communication media – ‘CHATBOTS’ using an online ‘messenger service’ which is taking the marketing, sales and customer services communication to a whole new and exciting level. Find out more about our Chatbot Training and our training schedules here. We Coach Small Businesses How To Grow, Automate & Thrive Using Infusionsoft! 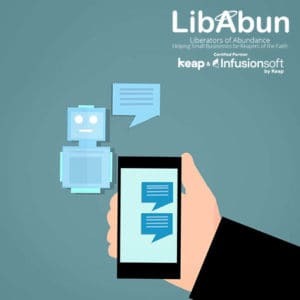 The team at LibAbun are ‘Certified Keap Infusionsoft by Keap Partners’ where we can train and advise Small Business Owners how to automate many facets of their marketing, sales, customer services, business reporting and so much more. Keap & Infusionsoft by Keap is an online CRM – Customer Relationship Manager system that is specifically designed to help Small Businesses, grow, automate and thrive in business. This is another brilliant automation tool for Small Businesses to really enhance your productivity, sales and growth and save time doing it. You can find out more about Keap & Infusionsoft by Keap and our Coaching and training services on how to use it here.